When we imagine a habitable planet beyond our solar system we tend to think of a “second Earth”, a twin of our planet which is lies at an ideal distance from its host star — a range of distance from a star where liquid water could exists on the planet’s surface — perhaps a little too hot (desert climate) or too cold (eternal winter). What is often forgotten is that there may exists environmental conditions conducive to life different from what we see on Earth. Exploring our solar system leads us to consider the possibility of life like we’ve never seen before on others world, for example, the oceans of Europe or Ganymede might well harbor life forms. Going far beyond our solar system, we can imagine even more favorable conditions on distant moons orbiting gas giants — Jupiter-sized planets — much like the forest moon of Endor (home of aliens’ race called Ewoks) in Star Wars or Pandora in Avatar. What discriminates the habitability of a satellite from the habitability of a planet in general is that it has different contributions to its energy budget. Several recent studies have been devoted searching for moons orbiting alien planets. Thus, two Canadian researchers at McMaster University explained that some exomoons could be the predominant sources for life in the universe if they are the right size, in the right position and have sufficient water to support life. If even some of these Jupiter-sized planets have moons, they might be the predominant sites of life in the universe. Indeed, many of the exoplanets discovered elsewhere in our galaxy are more like Jupiter, gas giants planets not hospitable to life, but the moons of these planets could be habitable. The new research published in the journal Astronomy and Astrophysics found that massive moons larger than Mars might be the best bet. We could be just a few decades from proving if there is life elsewhere. For all this time, we have been looking on other planets, when the answer could be on a moon. Compared to exoplanets, a big exomoon have an additional advantages on their potential livability: they could be protected from harmful radiation from its host star not by its own magnetic field like Earth but by the magnetosphere of the giant planet around which it revolve. Another examples include eclipses by their host planet, as well as reflected sunlight and heat emissions. Most of all, gravitationally induced tidal heating by a host planet can dramatically impact a moon’s climate and geology. However, detecting exomoons is particularly difficult, as their mass and size is so much less than their host planet. It might some traces of these distant moons already be present on kepler’s data or we may have to wait for more powerful planet-hunter to come online. A Harvard University project entitled “Hunt for Exomoons with Kepler” was also given the task of searching through kepler’ data hoping to unearth exomoons. 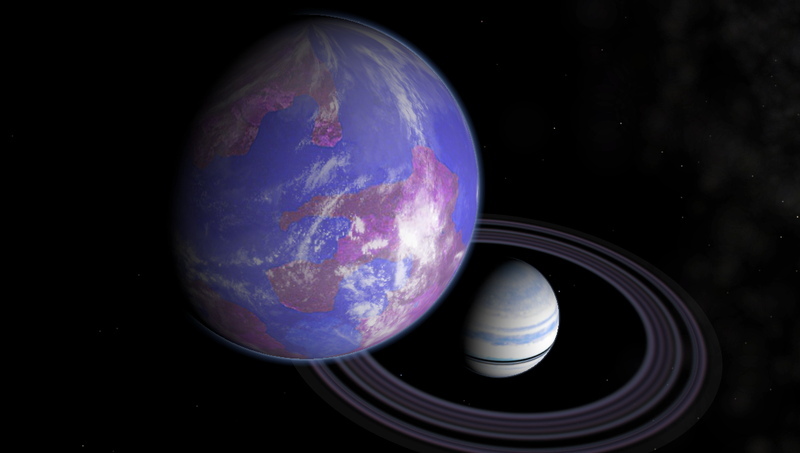 As far, no exomoon has been confirmed, although several candidates are waiting for approval. With about 4,000 exoplanets known to exist so far, and with increasing technological capabilities, an exomoon discovery is now looming on the horizon. Thus, in 2013, a study suggested the presence of the first exomoon beyound our solar system revolving around a gas giant (twice the mass of Jupiter) MOA-2011-BLG-262L b located about 22,000 light years away from us. In January this year, another study predicted the possibility of an exomoon orbiting around a gaseous planet 10 to 40 times the size of Jupiter, 420 light-years. Finding out if moons are common in our galaxy will be key for the search for life, and could signal a change in goals for planet-hunters in the near future.